Financial firm State Street–commissioner of the famous "Fearless Girl" statue on Wall Street–has agreed to pay several hundred workers a total of $5 million to settle a federal investigation charging that the company discriminated against women and blacks. In news reports and in advertising, State Street has tried to portray itself as an advocate for women climbing the corporate latter. Last month, the Financial Times published a list of male and female business executives who are “champions of women in business.” Among those higlighted was Jeff Conway, State Street's chief executive, because he increased the percentage of females on his executive team from 20% to 35%. Not mentioned in that write-up is the federal investigation that said that female and black executives at his company were paid less than their male counterparts. State Street has made made an aggressive, well-promoted push to position itself as a feminist corporation, most famously with its commissioning of the bronze “Fearless Girl” statue that faces off against Wall Street’s "Charging Bull". “We wanted to highlight the power of women in leadership,” State Street wrote in a Twitter post promoting the statue. It soon became a media sensation and popular tourist attraction. News outlet CNN celebrated the "Fearless Girl" for her ability to "stand her ground, even in the snow." The artist hired to create the sculpture, Kristen Visbal, said her work was meant to illustrate the challenges women on Wall Street face. 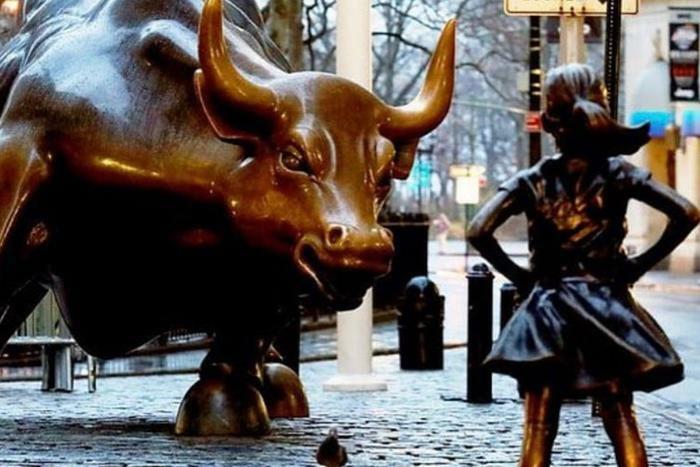 "Aesthetically, we wanted to create contrast between this larger-than-life, charging bull and this petite, delicate young woman to illustrate the magnitude of what women are up against in the workplace," Visbal had told Delaware Public Media. Neither Visbal nor State Street has returned a request for comment from ConsumerAffairs. The Department of Labor says in its complaint that State Street discriminated against women who held positions as senior vice president, managing director and vice president and blacks who worked in vice president positions by paying them less then male and white executives at the same level. The wage discrimination occured "since at least December 1, 2010," the agency says. State Street is denying the allegations but agreed to give a total 305 female executives and 15 black vice presidents backpay in the amount of $4.5 million total, as the Boston Globe reported. The workers will receive another $508,000 in interest. The racial pay gap has also remained staggeringly wide. Statistics from the Pew Research Center indicate that blacks in 2015 earned just 75 percent as much as whites did. Black and hispanic women are the lowest paid statistical groups compared to white men--earning a respective 65 and 58 cents on the dollar. As more attention has been called to the unequal treatment that women and minorities receive in the workplace, major corporations have tried to reframe their public images as champions of diversity. But companies may be more interested in projecting a diverse image than actually practicing it. Among the factors cited for holding back under-represented workers, (particularly women) are weak family and labor laws. The United States is the only industrialized nation that does not mandate paid maternity leave for workers. Simultaneously, early childhood care in some states costs more than college tuition, a factor that may make new parents question the value of their full-time job. Executives at major financial firms have tried to enact their own policies to assist parents, but those policies can be anemic compared to the benefits that women enjoy in other countries. The Financial Times on September 26 celebrated a total of 30 male executives (as well as 50 female executives) who are apparent champions of women in the workplace. The number one-ranked male, the chief executive of the international corporation Vodafone, was honored for a company policy that guarantees women a minimum of 16 weeks paid maternity leave and then allows mothers returning from leave to work four days per week while being compensated for five. Canadian women, by comparison, are guaranteed 52 weeks in paid maternity leave by their government.